Kai Tak Cruise Terminal (啟德郵輪碼頭) is the newest cruise terminal in Hong Kong, located at the former Kai Tak Airport runway. This new landmark in Victoria Harbour can berth the world’s largest cruise ships and host ship calls throughout the year. The Kai Tak Cruise Terminal is a three-storey building with a total length of 850 meters. It can accommodate two mega cruise ships of up to 220,000 tons at the same time, carrying a total of 5,400 passengers and 1,200 crew. Other than basic facilities such as baggage handling area, customs and immigration hall, passenger waiting hall and a car park, you can find Hong Kong Tourism Board Visitors Centre, a money exchange shop, several retail shops, Chinese and western restaurants as well as the largest rooftop park in Hong Kong. The Rooftop Park covers an area of 23,000 square meters featuring a central lawn, a water garden, a fountain plaza and a viewing platform where you can enjoy panoramic views of the iconic Hong Kong skyline. The Park opens from 7am to 11pm daily. In addition, the Terminal has outstanding eco-friendly features and the open-plan design make it suitable for all kinds of events, such as exhibitions and conferences, marriage and wedding reception as well as concerts. The Kai Tak Cruise Terminal was opened in 2013 and has since welcomed a variety of cruise lines including Celebrity, Costa, Dream Cruises, Holland America, Norwegian, Princess, Royal Caribbean, and Star Cruises. Just to name a few. Mariner of the Seas of Royal Caribbean International was the first cruise ship to dock at the new terminal after the opening of it in June 2013. Celebrity Millennium of Celebrity Cruises was actually the first cruise vessel to berth in March 2013 before the Terminal’s grand opening. Ocean Terminal (海運大廈) is a cruise terminal and shopping centre located on Canton Road in Tsim Sha Tsui, Kowloon, Hong Kong. Located next to the Star Ferry Pier, it began operations in March 1966. Ocean Terminal was the first shopping mall in Asia at that time. In 1987 it was re-branded together with nearby buildings as Harbour City and has become the largest shopping complex in Hong Kong since then. Ocean Terminal has an overall length of 380 meters which can berth two large cruise ships of up to 50,000 tons or four small cruise ships. Many famous cruise ships berthed at Ocean Terminal, including Queen Elizabeth II, once the world’s largest cruise ship. However, the capacity of Ocean Terminal is not enough for mega cruise ship to berth. Some cruise vessels had to berth at Kwai Tsing Container Terminals in the early 2000s. Therefore, Hong Kong Government decided to build Kai Tak Cruise Terminal. At present, Star Pisces of Star Cruises runs a daily schedule at Ocean Terminal. 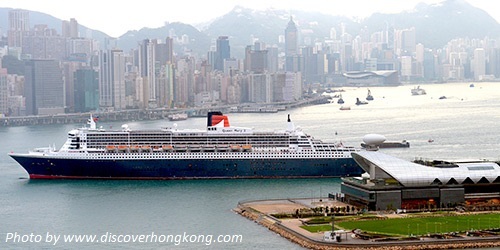 Are you planning to take some cruise trips at Kai Tak Cruise Terminal and Ocean Terminal Hong Kong? Thank you for reading this post. Feel free to leave us comments or contact us if you have any questions. Please like us on Facebook and share our post.